My friend Jenfu asked me to bake a cake for his girlfriend's birthday - a heart-shaped chocolate cake with strawberries. How sweet and adorable! I had never made a heart-shaped cake before but it turned out to be not so tricky. I baked the cakes in 9-inch rounds and carefully cut the cakes in a heart-shape before splitting them. There are so many different recipes for chocolate cakes out there. But this one's got to be one of my favorite ones. This chocolate cake uses a combination of both the melted bittersweet chocolate and cocoa powder with a touch of coffee to intensify the flavor for those chocolate lovers out there. And it has a perfect texture that is light, moist, and fluffy but firm enough to hold its shape to be split into thin layers for a multi-layer cake. I like my cake fluffy with a moist filling like bavarian cream or pastry cream. So for Jenfu, I created a three-layer dark chocolate cake with custard cream infused with vanilla and fresh strawberries. And it's topped off with light, airy vanilla meringue buttercream and decadent dark and white chocolate covered strawberries. I hope you and your girlfriend had a very special day together and enjoyed the cake! And in mid May, our team hit a very important milestone and decided to celebrate everyone's hard work and achievements by getting the whole team together with a delicious cake. While I was absolutely ecstatic when I was given the opportunity to make a cake for this very special occasion, I was also worried about my lack of experience in making such a large cake. But I managed to pull it off with the help my friend Penny and moral supports from my roommates. Thanks guys! I can't quite show the entire cake because the information written on the cake is apparently confidential, but I drew our Street View car camera system on the cake with frosting as per request! 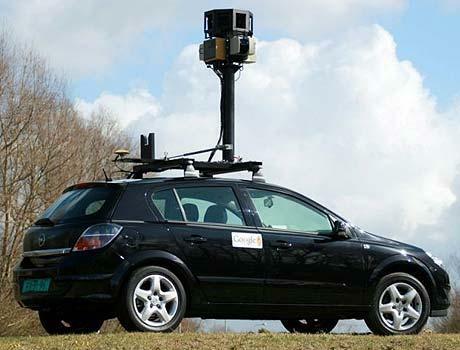 Here is an image of a Street View car with the camera system on top for a reference. I wanted to keep the flavors simple and do something chocolatey -- a pretty safe bet when the audience is as big as 30-40 people. It is a two-layer cake of light, moist devil's food cake and chocolate pastry cream between them and topped with fluffy vanilla buttercream. This is by far my biggest cake project up to date and it was definitely not easy, but seeing everyone on the team enjoying it made it all worth the time and effort. And my cake made it onto Twitter!